Straw-bale construction is a building method that uses bales of straw (commonly wheat, rice, rye and oats straw) as structural elements, building insulation, or both. This construction method is commonly used in natural building or "brown" construction projects. Research has shown that straw-bale construction is a sustainable method for building, from the standpoint of both materials and energy needed for heating and cooling. Advantages of straw-bale construction over conventional building systems include the renewable nature of straw, cost, easy availability, naturally fire-retardant and high insulation value. Disadvantages include susceptibility to rot, difficulty of obtaining insurance coverage, and high space requirements for the straw itself. Research has been done using moisture probes placed within the straw wall in which 7 of 8 locations had moisture contents of less than 20%. This is a moisture level that does not aid in the breakdown of the straw. However, proper construction of the straw-bale wall is important in keeping moisture levels down, just as in the construction of any type of building. Straw houses have been built on the African plains since the Paleolithic Era. Straw bales were used in construction 400 years ago in Germany; and straw-thatched roofs have long been used in northern Europe and Asia. When European Settlers came to North America, teepees were insulated in winter with loose straw between the inner lining and outer cover. The first documented use of hay bales in construction in Nebraska was a schoolhouse built in 1896 or 1897. Unfenced and unprotected by stucco or plaster, it was reported in 1902 as having been eaten by cows. 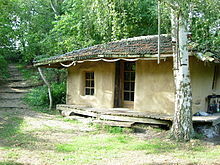 To combat this, builders began plastering their bale structures; if cement or lime stucco was unavailable, locally obtained "gumbo mud" was employed. Between 1896 and 1945, an estimated 70 straw-bale buildings, including houses, farm buildings, churches, schools, offices, and grocery stores had been built in the Sandhills. In 1990, nine surviving bale buildings were reported in Arthur and Logan Counties, including the 1928 Pilgrim Holiness Church in the village of Arthur, which is listed in the National Register of Historic Places. Since the 1990s straw-bale construction has been substantially revived, particularly in North America, Europe, and Australia. This revival is likely attributed to greater environmental awareness and the material's natural, non-toxic qualities, low embodied energy, and relative affordability. Straw-bale construction has encountered issues regarding building codes depending on the location of the building.. However, in the USA, the introduction of Appendices S and R in the 2015 International Residential Code has helped to legitimize and improve understanding of straw-bale construction. In France, the approval in 2012 of professional rules for straw-building recognized it as “common technology” et qualifies for standard-insurance programs. Straw bale building typically consists of stacking rows of bales (often in running-bond) on a raised footing or foundation, with a moisture barrier or capillary break between the bales and their supporting platform. There are two types of straw-bales commonly used, those bound together with two strings and those with three. The three string bale is the larger in all three dimensions. Bale walls can be tied together with pins of bamboo or wood (internal to the bales or on their faces), or with surface wire meshes, and then stuccoed or plastered, either with a lime-based formulation or earth/clay render. The bales may actually provide the structural support for the building ("load-bearing" or "Nebraska-style" technique), as was the case in the original examples from the late 19th century. The plastered bale assembly also can be designed to provide lateral and shear support for wind and seismic loads. Alternatively, bale buildings can have a structural frame of other materials, usually lumber or timber-frame, with bales simply serving as insulation and plaster substrate, ("infill" or "non-loadbearing" technique), which is most often required in northern regions and/or in wet climates. In northern regions, the potential snow-loading can exceed the strength of the bale walls. In wet climates, the imperative for applying a vapor-permeable finish precludes the use of cement-based stucco. Additionally, the inclusion of a skeletal framework of wood or metal allows the erection of a roof prior to raising the bales, which can protect the bale wall during construction, when it is the most vulnerable to water damage in all but the most dependably arid climates. 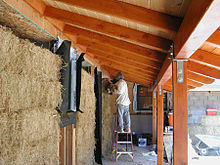 A combination of framing and load-bearing techniques may also be employed, referred to as "hybrid" straw bale construction. Straw bales can also be used as part of a Spar and Membrane Structure (SMS) wall system in which lightly reinforced 5 - 8 cm (2 - 3") gunite or shotcrete skins are interconnected with extended "X" shaped light rebar in the head joints of the bales. In this wall system the concrete skins provide structure, seismic reinforcing, and fireproofing, while the bales are used as leave-in formwork and insulation. The University of Bath has completed a research programme which used ‘ModCell’ panels - pre-fabricated panels consisting of a wooden structural frame infilled with straw bales and rendered with a breathable lime-based system - to build 'BaleHaus', a straw bale construction on the university's campus. Monitoring work of the structure carried out by architectural researchers at the university has found that as well as reducing the environmental footprint, the construction offers other benefits, including healthier living through higher levels of thermal insulation and regulation of humidity levels. The group has published a number of research papers on its findings. Typically "field bales" (bales created on farms with baling machines) have been used, but recently higher-density "precompressed" bales (or "straw-blocks") are increasing the loads that may be supported. Oryzatech out of Goleta, California has been developing rice straw compressed block. Field bales might support around 900 kg per linear meter of wall (600 lb./ lin. ft.), but the high density bales bear up to 6000 kg per linear meter of wall (4,000 lb./lin.ft. ), and more. The basic bale-building method is now increasingly being extended to bound modules of other oft-recycled materials, including tire-bales, cardboard, paper, plastic, and used carpeting. The technique has also been extended to bags containing "bales" of wood chips or rice hulls. Straw bales have also been used in very energy efficient high performance buildings such as the S-House in Austria which meets the Passivhaus energy standard. In South Africa, a five-star lodge made from 10,000 strawbales has housed luminaries such as Nelson Mandela and Tony Blair. In the Swiss Alps, in the little village of Nax Mont-Noble, construction works have begun in October 2011 for the first hotel in Europe built entirely with straw bales. The Harrison Vault, in Joshua Tree, California, is engineered to withstand the high seismic loads in that area using only the assembly consisting of bales, lath and plaster. The technique was used successfully for strawbale housing in rural China. Straw bale domes along the Syrio-African rift at Kibbutz Lotan have an interior geodesic frame of steel pipes. Another method to reap the benefits of straw is to incorporate straw-bale walls into a pre-existing structure. Compressed straw bales have a wide range of documented R-value. R-value is a measurement of a materials insulating quality, higher the number the more insulating. The reported R-value ranges from 17-55 (in American units) or 3-9.6 (in SI) depending on the study, differing wall designs could be responsible for wide range in R-value. Bale walls are typically coated with a thick layer of plaster, which provides a well-distributed thermal mass, active on a short-term (diurnal) cycle. The combination of insulation and mass provide an excellent platform for passive solar building design for winter and summer. Compressed and plastered straw bale walls are also resistant to fire. Two significant problems related to straw-bale construction are moisture and mold. During the construction phase, buildings need to be protected from rain and from water leakages into the body of the walls. If exposed to water, compressed straw may expand due to absorption of moisture. In turn, this can cause more cracking through which more moisture can infiltrate. Further damage to the wall can be caused by mold releasing potentially toxic spores into the wall cavities and into the air. In hot climates, where walls may have become internally dampened, internal temperatures may rise (due to decomposition of affected straw). While fire is generally considered a rare event, compressed straw or hay bales have the serious potential of undergoing spontaneous internal combustion. Rats and mice can infiltrate straw bale homes during construction, so care must be taken to keep such animals out of the material. Other problems relate to straw dust which may cause breathing difficulties among people with allergies to straw or hay. Several companies have developed prefabricated strawbale walls. A passive ecological house can easily be assembled with those panels. ^ "S-House writeup" (PDF). Retrieved 2014-04-08. ^ Milutiene, Edita, et al. "increase in Buildings Sustainability Using Renewable materials and Energy." Clean Technologies & Environmental policy 14.6 (2012): 1075-84.Print. ^ Canada Mortgage and Housing Corporation. "Energy Use In Straw Bale Houses". Retrieved on 4 September 2008. ^ a b Steen, Steen & Bainbridge (1994). The Straw Bale House. Chelsey Green Publishing Co. ISBN 0-930031-71-7. ^ a b Magwood & Mark (2000). Straw Bale Building. New Society Publishers. ISBN 0-86571-403-7. ^ Webster, Ben (2010-05-20). "Huff as hard as you like - you can't blow a straw house down". London: The Times, May 20, 2010. ^ Goodhew, Steve, Richard Griffiths, and Tom Woolley. "An Investigation of the Moisture Content in the Walls of a Straw-Bale Building." Building and Environment39.12 (2004): 1443-51. Print. ^ a b c Marks, Leanne R. (2005). "Straw Bale as a Viable, Cost Effective, and Sustainable Building Material for use in Southeast Ohio". Master's thesis, Ohio University. Retrieved 2010-08-10. ^ Nebraska Historic Buildings Survey: Custer County Nebraska State Historical Society. Retrieved 2010-08-29. ^ a b Spencer, Janet Jeffries and D. Murphy (1979). "National Register of Historic Places Inventory–Nomination Form: Pilgrim Holiness Church" Nebraska State Historical Society. Retrieved 2010-08-10. ^ a b Hammett, Jerilou and Kingsley (1998). "The Strawbale Search". DESIGNER/builder magazine, August 1998. Article reproduced at "The Last Straw" website. Retrieved 2010-08-10. ^ Kay, John, David Anthone, Robert Kay, and Christina Hugly (1990). "Nebraska Historic Buildings Survey, Reconnaissance Survey Final Report of Arthur County, Nebraska." Nebraska State Historical Society. Retrieved 2010-08-29. ^ Hollis, Murray (2005). Practical Straw Bale Building. Collingwood: Landlinks Press. ISBN 0-643-06977-1. ^ Hammer, Martin (1 February 2006). "Ten years Later: Strawbale in the Building Codes". Buildinggreen.com. Retrieved 4 October 2013. ^ Jones, Barbara (2002). Building with Straw Bales: A Practical Guide for UK and Ireland (2011 ed.). Dartington, Totnes, Devon TQ9 6EB: Green Books. p. 26. ISBN 978-1-900322-51-5. ^ Keefe, Chris. "Straw Bale Design - Choosing the Right Size Straw Bales". Strawbale.com. ^ Malin, Nadav (1 May 1993). "Building With Straw Bale". .buildinggreen.com. Retrieved 5 October 2013. ^ Myhrman, Matts; S.O. MacDonald (1994). Build it with Bales. Out on Bale. ISBN 0-9642821-1-9. ^ "BaleHaus: innovation in straw bale building". The University of Bath. Retrieved 8 July 2014. ^ Wilson, Alex (1 December 2009). "Lego Blocks from Straw". Buildinggreen.com. ^ Hans-Peter Petek. "S-House". S-house.at. Retrieved 2014-04-08. ^ "Five Star Didimala Lodge Is The World's Largest Strawbale Building!". Inhabitat. Retrieved 2014-04-08. ^ "Blog about the first hotel built with straw bales". Mayaguesthouse.wordpress.com. Retrieved 2014-04-08. ^ "Google Drive Viewer". Docs.google.com. Retrieved 2014-04-08. ^ a b "Google Drive Viewer". Docs.google.com. Retrieved 2014-04-08. ^ Whitty, Cadmon. "I Wrapped My House in Straw: A Straw Bale Builder Turns an Ugly old, Energy-Eating House into a Cozy, Efficient Home with a Unique Straw Bale Retrofit Process." Natural Life Sept.-Oct. 2009 Print. ^ "R-Value of Straw Bales Lower Than Previously Reported - EBN: 7:9". Buildinggreen.com. Retrieved 2014-04-08. ^ "Straw Bale Fire Test Video - Ecological Building Network". Ecobuildnetwork.org. Retrieved 2014-04-08. ^ Kuhn, D. M.; Ghannoum, M. A. (2003). "Indoor Mold, Toxigenic Fungi, and Stachybotrys chartarum: Infectious Disease Perspective". Clinical Microbiology Reviews. 16 (1): 144–172. doi:10.1128/CMR.16.1.144-172.2003. PMC 145304. PMID 12525430. Corum, Nathaniel (2005). Building a Straw Bale House: The Red Feather construction handbook. New York: Princeton Architectural Press. ISBN 978-1-56898-514-5. King, Bruce (2006). Design of Straw Bale Buildings: The State of the Art. San Rafael, CA: Green Building Press. ISBN 978-0-9764911-1-8. Magwood, Chris; Mack, Peter; Therrien, Tina (2005). More Straw Bale Building: A complete guide to designing and building with straw. Gabriola Island, B.C. : New Society Publishers. ISBN 978-0-86571-518-9. Steen, Athena Swentzell; et al. (1994). The Straw Bale House. White River Junction, Vt.: Chelsea Green Publ. Co. ISBN 978-0-930031-71-8. 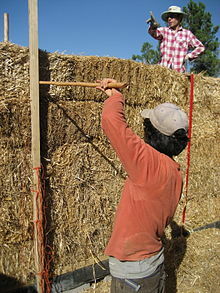 Wikimedia Commons has media related to straw-bale construction. Community Rebuilds - Nonprofit providing internships in straw bale construction and utilizing straw bale in affordable housing. Rawlinson, Linnie. Artist Gordon Smedt's straw-bale house, feature on CNN.com, 13 August 2007. With image gallery. Long Branch Environmental Education Center: Possible concerns regarding mold and humidity, technical paper, 2002. "The Church That's Built Of Straw." Popular Mechanics, April 1960, pp. 130–131.